Unfortunately most of my Raceway memories are gone - since I didn’t manage to jot them down upon returning from Indy... thus I’ll just leave you with the remaining highlights, and although it was definitely warm out that day, it would be nothing compared to the following year’s blistering H-O-T temperature! 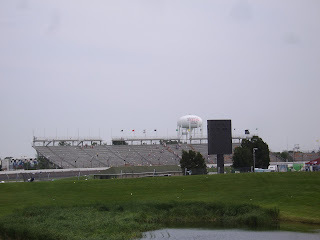 As I vaguely recall sitting outside in front of the fountain near the IMS Hall of Fame museum? Whilst we awaited my ‘Kuhnaidiun “Bro” Rob to return from his souvenir shopping escapade, whilst I’d become his honorary brother due to my sporting my I AM ‘KUHNAIDIUN T-Shirt today in support of ‘TAG (Alex Tagliani) starting from Pole; as Tagliani really deserves to have more than one stinkin’ IndyCar victory in his resume, eh? The coolest exhibit we perused pre-race; NO! NOT the ‘Chebbie caravan, but was an amazing ‘Tarsch-jey Cut-away car display, as Rob pointed out various portions of I-T to Mwah before we finally sauntered off in the direction of our seats, situated fairly low down upon the main straightway directly across from Pitlane. Thus, tagging along with Dave & Rob, I recall a few drunken fans behind us pre-race asking facetiously if they could just use my back to brace their program against while trying to sort out who was in what car... Pretty funny; NOT! Hmm, welcome to the real Indy? Thus it was funny hearing Parnelli in early 2013 on Trackside with Kevin & Cavin admitting he’d heard ‘Somme-thun go KABLAMOE as he motored down the back-straight, as the Wasp had thrown a piston and left a major sized hole in its block; Aye Karumba! We walked up a series of starch white concrete steps that led to a small, shaded semi-circle area with a bronze of Eric Medlen, who’d lost his life in a testing accident aboard one of Force’s Ford Mustang Top Fuel ‘FunnyCarz during a testing accident in 2007.